Monsters roam the night! Creatures of horror stalk human prey! Strange happenings ending in violent death! All of this and more the product of insane science perpetrated by men and women most would call mad! IT’S ALIVE: TALES OF MAD SCIENTISTS from Pro Se Productions brings that most unusual of characters into the glow of the flashing lightning in the night sky! The Mad Scientist, certain that what they do is for the good of the world, or perhaps only because Science demands they do it, or even simply because they can! Whatever the motivation, authors Hope Erica Schultz, Forrest Dylan Bryant, and Carson Demmans dig deep into the twisted minds of those who seek to further Science by breaking the very laws of reality! Listen…You’ll hear them as electricity sizzles, as solutions boil and bubble. There, hear it? That maniacal scream of… IT’S ALIVE! TALES OF MAD SCIENTISTS From Pro Se Productions. 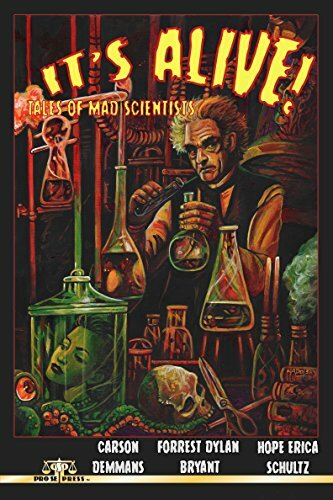 Featuring an awesome cover by Larry Nadolsky and cover design and print formatting by Antonino Lo Iacono, IT’S ALIVE: TALES OF MAD SCIENTISTS is available now at Amazon at https://www.amazon.com/Its-Alive-Tales-Mad-Scientists/dp/1535029226/ref=sr_1_2?s=books&ie=UTF8&qid=1471364374&sr=1-2&keywords=it%27s+alive+mad+scientists and Pro Se’s own store at www.prose-press.com for 10.00. This creepy, kooky anthology is also available as an Ebook, designed and formatted by Lo Iacono for only $2.99 for the Kindle at https://www.amazon.com/Its-Alive-Tales-Mad-Scientists-ebook/dp/B01HZ3ZMX4/ref=sr_1_1?s=books&ie=UTF8&qid=1471364670&sr=1-1&keywords=it%27s+alive+mad+scientists#nav-subnav and for most digital formats via Smashwords at https://www.smashwords.com/books/view/648321. MAXIM GUNN SOUNDS OFF AGAIN! ‘THE SERPENT FORCE’ NOW AVAILABLE IN AUDIO!